1. Arian Foster, HOU (8): One of the few elite options at the position, Foster finished fourth in fantasy points among fantasy backs despite missing almost all of four games. He’s back and healthy this year. Watch out. 2. LeSean McCoy, PHI (7): Shady got into the end zone 20 times last year and was one of the lone bright spots in Philly. He and Ray Rice both make sense as the number two back, but McCoy is used more in the passing game, so I’m giving him the edge. 3. Ray Rice, BAL (8): He had a career-best fantasy season and earned himself a five-year contract. He’s the key to Baltimore’s offense and will see plenty of touches. The only reason he’s not higher on this list is the Ravens didn’t fully commit to giving him the ball every game. Hopefully they’ve learned their lesson. 4. Chris Johnson, TEN (11): Had one of the best-ever fantasy seasons in 2010, living up to the nickname CJ2K. Last year he was just out of synch, thanks to his holdout and the league’s lockout. He’s more focused this year and will get more work with 2nd-year pro Jake Locker taking over the starting QB job. 5. Maurice Jones-Drew, JAX (6): Would be near the top of this list, but holdouts always seem to affect a player (see above). I’ll feel much better about MJD when he gets back into camp. 6. Matt Forte, CHI (6): He led the NFL in yards from scrimmage when he was healthy last year, before a knee injury held him out of the final four games. The Bears brought in Mike Tice to be the offensive coordinator and he’s made it known he wants the running game to be the focus of the offense. Don’t worry about Michael Bush, Forte is still the man in Chi-town. 7. Jamaal Charles, KC (7): Last year he was a top-5 fantasy back but killed a number of fantasy teams when he tore his ACL in the second week. He’s fully healthy and has shown what he can do even when sharing the load in the backfield (see Peyton Hillis below). Many fantasy sites will undervalue Charles this season. Those sites will be wrong. 8. Marshawn Lynch, SEA (11): Skittles for everyone! In a world of platoon backfields, Lynch is one of the few lead backs out there. Still, which Lynch will fantasy owners get this year: The 2011 version of Beast Mode or the guy who didn’t seem to care in Buffalo? I tend to think the former, but be fantasy owners should be warned. 9. Adrian Peterson, MIN (11): Peterson is a freak of nature and looks like he’ll be ‘healthy’ for the start of the season. Yes, he’s probably coming back too early and very well could be injured again. But as a late second or early third round pick, isn’t the risk worth the reward? 11. Ryan Mathews, SD (7): Mathews put together the kind of season the Chargers were expecting when they drafted him in the first round. The worry for fantasy fans is whether he can stay healthy for 16 games. He didn’t get off to a good start in the preseason, breaking his collarbone on his first carry. That being said, he’ll be ready for the beginning of the season. 12. 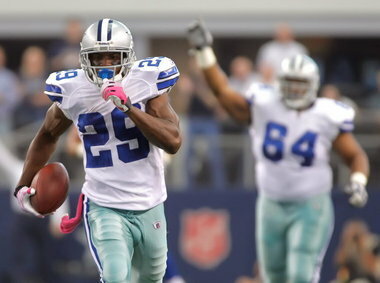 Darren McFadden, OAK (5): Was on his way to a special fantasy season before getting hurt in week seven. Michael Bush is no longer in Oakland to steal carries, but will McFadden stay healthy (see, I told you this would be a trend). 13. Fred Jackson, BUF (8): I’m sounding like a broken record at this point. Jackson was on his way to a top-five fantasy season before breaking his right leg in week 11. He’s back, but will have to split the load with C.J. Spiller. 14. Steven Jackson, STL (9): Jackson’s best fantasy years were wasted by the Rams, and for that, they owe all fantasy owners an apology. He’s still able to put up good fantasy numbers and St. Louis should be better, but there is a lot of tread on his tires. 15. Michael Turner, ATL (7): Turner started to break down at the end of the season, averaging an uninspiring 3.2 yards per carry in his final six games (not counting the week 17 matchup with Tampa Bay when the Bucs just wanted the season to end). The Falcons are quickly becoming a passing team, but expect Turner to still be the top option around the red zone. 16. Trent Richardson, CLE (10): Richardson has the talent to put of a big year but will the Browns do enough to let him blossom? Also, I’m not thrilled to see him suffering injuries before the season even begins. 17. Darren Sproles, NO (6): In a PPR league, he’s a top-10 running back. Even in a standard scoring league, it’s hard to pass up a guy who touched the ball 173 times last season. He has the confidence of Drew Brees and that’s good enough for me. 18. Ahmad Bradshaw, NYG (11): Bradshaw fought a number in injuries last year after his stellar 2010 fantasy season. His production this season will come down to his health and the development of his offensive line. 19. Frank Gore, SF (9): Gore did a lot of great things for fantasy owners and that won’t be forgotten. That being said, I am very down on Gore this season. The 49ers backfield is a jumbled mess between free agent additions and draft picks and the prevailing thought is Gore will be hard-pressed to replicate his 20-plus touches per game. 20. BenJarvus Green-Ellis, CIN (8): My fantasy sleeper running back, the Law Firm is finally out of the fantasy wasteland that was the Patriots backfield and will be given the opportunity to shine in Cincy. 21. Reggie Bush, MIA (7): Miami’s offense will be a work in progress with a rookie QB under center. That should only mean more touches for Bush. Don’t forget, he’ll also be very involved in a passing game that is extremely thin at wide receiver. 22. Beanie Wells, AZ (10): There’s good Beanie Wells and bad Beanie Wells. The good is the guy who rushed for over 1,000 yards and 10 scores last year. The bad is the guy who continually struggles to stay off the injury report. 23. Doug Martin, TB (5): Greg Schiano has no ties to LeGarrette Blount and has been extremely high on Martin, even comparing him to Ray Rice. Martin is a three-down back and will be given ample opportunity to keep the starting job. 24. Shonn Greene, NYJ (9): The Jets’ offense is going to be bad. At least Green should get the ball in Tony Sparano’s offense. Let’s just hope that Tim Tebow doesn’t take away too many goal line carries. 25. Jonathan Stewart, CAR (6): If he was the lead back in Carolina, you’re looking at a top-10 fantasy RB. Alas, the jumble in the Panthers backfield brings down the value of every guy. And honestly, Cam Newton’s goal line carries aren’t helping anyone either. 26. Willis McGahee, DEN (7): Peyton Manning will make the Broncos’ offense better, but the focus will shift away from the run game. Still, McGahee will see the field plenty and is the top option around the goal line. 27. Stevan Ridley, NE (9): Gets the first crack at replacing Green-Ellis as the Patriots lead back. Fantasy owners should be warned; Bill Belichick hates fantasy owners and will rotate a number of players in the backfield. You’ve be warned. 28. Isaac Redman, PIT (4): With Rashard Mendenhall injured to start the season and no experienced options behind him, Redman figures to see plenty of work early. 29. Cedric Benson, GB (10): Possibly the most talented back Green Bay has had in a while. This is a passing team, but Benson’s use in this Thursday’s preseason game should be monitored. He’s an interesting prospect. 30. Ben Tate, HOU (8): Backing up Arian Foster would kill a lot of player’s fantasy potential, but the Texans lead the league in run attempts and give both backs carries. Tate topped double digit fantasy points six times last season and his stock would soar if Foster were injured. 31. 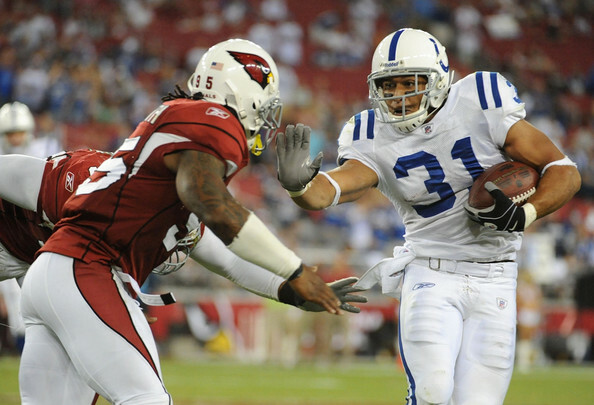 Donald Brown, IND (4): He’s claimed the Colts starting job and has looked extremely effective in the preseason. At the very least, you know he’ll get a solid number of carries. At this point on the list, that’s all you can ask. 32. Kevin Smith, DET (5): Jahvid Best is on the PUP list and might not even play this year. Kevin Smith is the starter for the foreseeable future. 33. Roy Helu, WSH (10): Never trust a running back on a Mike Shanahan team. Never. Helu might get 20 carries one game and not sniff the ball for the next three. There’s just no way to know. Pass on all the Redskins’ backs. 34. DeAngelo Williams, CAR (6): See Stewart, Jonathan. 35. C.J. Spiller, BUF (8): Spiller came on strong in relief of Fred Jackson, showing a propensity to catch the ball out of the backfield. The Bills are rumored to use Spiller as a wide receiver in a number of sets, so his value might be highest in a PPR league. 36. Mark Ingram, NO (6): Ingram is in a loaded backfield in a pass-heavy offense. The talent is there, but he might not be more than an injury replacement until the Saints show they are committed to the run. 37. Peyton Hillis, KC (7): His terrible 2011 season got him shipped out of Cleveland and backing up Jamaal Charles in KC. He’s an elite goal line back and a number of fantasy ‘experts’ are high on Hillis, but I’ll wait to see how he’s used before getting too excited. 38. Toby Gerhart, MIN (11): It would behoove the Vikings to bring back Adrian Peterson slowly to keep him healthy. At the very least, that means a lot more Toby Gerhart early in the season. And if AP can’t stay healthy, Gerhart becomes a good back to have on your roster. 39. David Wilson, NYG (11): Ahmad Bradshaw suffered through injuries last year. Wilson is a speedster with a very unique skillset and should find ways to get onto the field. Thomas a sleeper in Miami? 40. Daniel Thomas, MIA (7): Thomas had over 200 yards in his first two games, but seemed a little overwhelmed with the spotlight his rookie year. Bush is the main guy in Miami, but Thomas has talent to begin to take away carries. 41. Felix Jones, DAL (5): Had a chance at the starting job a year ago and pulled a ‘Felix Jones’ by showing a lack of durability and effectiveness. The talent is there, but like many fantasy owners, the Cowboys might be fed up with the act. 42. James Starks, GB (10): With Green Bay getting rid of Ryan Grant, it appeared Starks was ready to be ‘the guy.’ Instead he struggled in the preseason, living up to his fragile moniker and forcing the Packers to sign Cedric Benson. As it stands, expect Starks to be nothing more than a backup on a pass-heavy offense. 43. 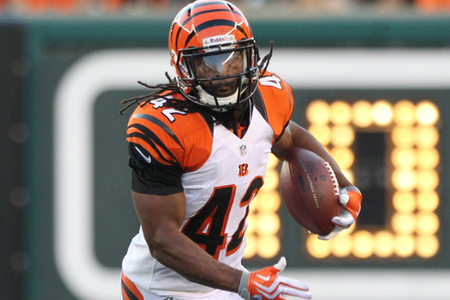 Bernard Scott, CIN (8): If Green-Ellis doesn’t perform well in Cincy; Scott will get the first crack at replacing him. He’s got the makeup to be a three-down back, but clearly the Bengals didn’t see enough to make him the guy this offseason. 44. Shane Vereen, NE (9): Will see carries and will get the first crack to step in if Stevan Ridley can’t get the job done. 45. LeGarrette Blount, TB (5): Rookie running backs are known to struggle and Blount is hungry since losing his job to Doug Martin. Let’s just say if he gets the opportunity to win back his spot at some point in the season, I’d want Blount on my team. 46. Pierre Thomas, NO (6): See Ingram, Mark. 47. Jonathan Dwyer, PIT (4): Isaac Redman is far from established and has struggled with a nagging hip injury in training camp. Dwyer’s the next man up if Redman is hurt or ineffective. 48. Ryan Williams, AZ (10): If Cardinals fans see the bad Beanie Wells reemerge, Williams is going to be a hot commodity. 49. Rashard Mendenhall, PIT (4): At this point in our rankings (and in your fantasy draft), Mendenhall is worth a pick. He’ll return around midseason and at the very least will be a more than capable fantasy backup. 50. Mikel Leshoure, DET (5): As noted earlier, there is a real chance Jahvid Best will spend the entire season on the PUP list. Leshoure has made more news off the field than on, but Kevin Smith isn’t exactly a top-flight prospect. Expect Leshoure to get a shot at some point. more of yohr useful information. Thanks for the post.